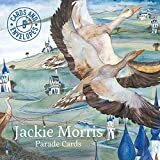 This pack of five greetings cards features five different illustrations from Jackie Morris' best-selling children's books, loved by children and adults alike. This series features images from Cat & the Fiddle and The Barefoot Book of Classic Poems. Suitable for any occasion, each card is blank for your own message. Each card has a caption written by Jackie and is supplied cello-wrapped with an envelope.